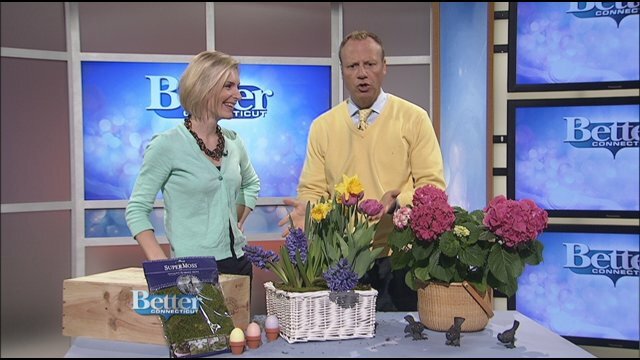 Julie The Garden Fairy: Easter Flowers- Easy and Fabulous! I like this trio of purple hyacinths, pink tulips and yellow daffodils together. But, I have seen a lot of monochromatic color schemes in arrangements lately. You could use all white bulbs, or yellow and white for a crisp, fresh look. 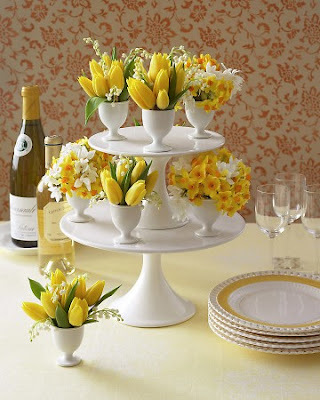 Think about what other colors will grace your Easter table and pull your bulb selection from that. Once these flowers have almost expired, I will deadhead them (remove the flower stems) and plant them out in the garden. If you leave the flowers for too long, they will begin to go to seed which robs the bulb of energy. Removing the flowers ensures that the bulb will be re-charged to flower again next year. Be sure to leave the foliage alone and only remove it once the leaves turn yellow and begin to dry up.